$9.99 for first kit + $7 for each additional kit ordered. Includes FREE (Domestic U.S.) Shipping! Please note that this kit works only on the later, post-2002 version of the Nady SCM-900, which uses the same circuit as the MXL 990, 603S, MCA SP-1, and V63M, among others. Older pre-2002 versions of the SCM-900 featured the same circuit and transformer-coupled output as the MXL 2001. Those early versions can be modified using our 2001 mod kit. 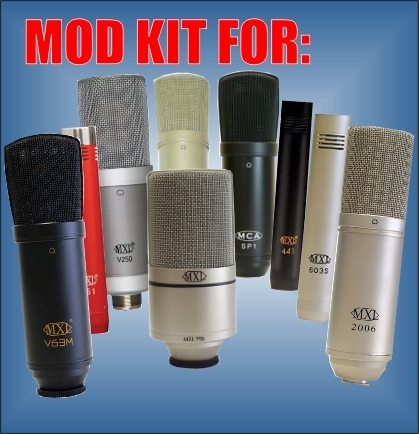 PDF download with 13 pages of newly-revised, detailed, illustrated instructions for performing the mod on each of the 3 basic variants of microphones represented above: small, medium, and large-bodied mics. To perform the mod, you will remove two capacitors from one side of the printed circuit board and replace them with the metal film caps. Then, you will remove the ceramic capsule/gate cap from the opposite side of the circuit board, and replace it with the polystyrene cap. These capacitors are non-polarized, so it doesn’t matter which lead you connect to which side. Most who have performed this mod say it takes about 15 to 20 minutes per mic, and makes a significant improvement in the sound. Please note that our mod kits only work on versions of these mics that use through-hole components (as opposed to surface-mount or SMT). Please consult the Compatibility page for complete details. IMPORTANT: We ship only to the Domestic U.S.–no International orders, please.